If you love spending time on the sea and fell in love with the freedom of a kayak, you need the best quality model. Just choose one from the list below then pack your food and others necessary gears and go for the voyage at sea! Our goal is to help you figure out the right sea kayak for you. Here we will cover all the information you need to know when purchasing. We tried to answer almost all of your questions in your mind. To have a good time in the waters, you need a reliable kayak whether you are a beginner or pro paddler. Getting a good quality kayak has many advantages. Here, we are going to share some of the pros, cons, and as well as other vital information to help you when you are in the market to choose the best sea kayak. We hope after reading this article, you can decide effortlessly if these kinds of kayaks are the right or which one is the best for you and your paddling needs. So Let’s begin. With its slim deck profile, you will have a personal riot while driving this kayak. It is an extremely beautiful kayak keeping control and smooth handling on any environment. The Riot Edge 14.5 Sea Kayak is very comfortable and feels very safe. The kayak is light enough to transport yet sturdy sufficient with its stiff center spine in the water. It has come with the drain plugs, adjustable padded seat with the spacey leg room. All in all the kayak is ideal for your needs and lots of fun. Besides the features mentioned above, this Edge 14.5 also offers adjustable sliding foot-braces, reflective lifelines, bulkhead-sealed rear and front compartments with the dual-density hatch cover, pilot rudder system, integrated thigh-braces, fore and aft shock cord storage with paddle hook & safety straps, and security bar. The Edge 14.5 measures 14.5-feet by 22.5-inches by 12-inches and weigh about 60 pounds. The cockpit is 36.5-inches by 19.5-inches, and the hatch is 15.75-inches by 8.13-inches. Overall, It is of the top quality professional workmanship at a reasonable price. If you are looking for lightweight day touring kayak that you can haul by yourself without a truck or a buddy, this Bay ST is great which tracks pretty good, light and floats well and it is cheaper than most similar weight kayaks. The kayak is very responsive and turns very well. Steering through heavy current is also simple and easy. No rudders needed. The seat is very comfortable, and the foot straps are easy to adjust. It is simple to assemble/disassemble and have fewer parts to worry about losing. The Bay ST is manufactured based on the original Oru folding kayak. This version is more comfortable to use. The length and contouring make it sporty and fast. There is also enough room to stash gear. Best of all, transforming it to boat takes just a few minutes. Great kayak for sailboats, fishing and backcountry trips. Larger paddlers who are looking for a stable boat that will run rivers, lakes, ponds, and for light fishing, the Pungo 120 are the perfect option for them. This kayak is fantastic, moves quickly, and is incredibly stable with a large cockpit. This kayak features a comfortable seat and a very low center of gravity. This product allows you a chance to have a swift, stable, and easy to maneuver the kayak. The cockpit is spacious, maybe even spacious by kayak standards. 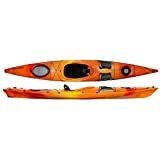 This is an excellent kayak for a short trip or a day of paddling. The Wilderness Systems Pungo 120 Kayak is the perfect combination of speed, stability, and manageability. The boat weighs about 49 pounds, and max weight capacity is 300 pounds. 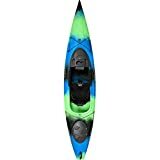 Overall, this is an excellent kayak for an intermediate paddler who doesn’t want to spend a boatload of money. If you are getting into kayaking and on a budget, the Aruba SS 12-ft is the best option for you. It has solid stability, tracks, and manoeuvers well. But it offers enough storage space including a small bow hatch, Rod Holders, enough room in the cockpit and finally the P.A.C. The PAC is a smart little storage compartment to keep your clothes, food, cell phone, and wallet dry. The seat and foot pads are adjustable to fit various sizes people. The Sun Dolphin Aruba SS 12ft is relatively reorganized as the recreational kayak. Its straight-line keel helps smooth tracking in calmer waters without compromising maneuverability very much. It also features flush mount fishing rod holders. The boat is lightweight and easy to carry. The kayak weighs about 47 pounds with the weight capacity of 250 pounds. Available in blue, lime and red. If you are looking for a reliable kayak to have a good time in the sea without worrying about your safety, the Sun Dolphin Aruba 10 has the reputation over the years. The Aruba SS hull design gives it the best combination of turning and tracking. 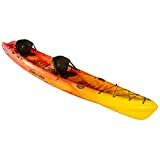 This kayak features convenient gear storage, shock cord deck rigging, and it also has adjustable foot braces in addition to a spray deflector collar. It has all the basic features you need out in the waters. The Aruba SS 10 feet also features hands-free electronics console, paddle and water bottle holders and shock cord deck rigging, you will find them handy while in the water. This model is ten feet long, 30 inches wide, 13 inches tall, and it weighs about 40 pounds. The kayak has a weight capacity of 250 pounds. They are available in multiple color options: red, lime, orange and ocean. The Brittany is the award-winning British-style sea kayak featuring a retractable skeg and pilot rudder system. Because of the size, the Brittany is fast and tracks like an arrow. It is also very responsive and stable. Seat comfort is excellent, and the back band is also good and gives no back pain. The Brittany is more capable and requires less effort to keep speed. The low deck offers you more efficiency in windy condition. Great tracker with the skeg down. The rudder is suitable for the beginners. The Brittany 16.5 measures 16.5ft by 21.75in by 12.5in and weigh about 51 pounds. The cockpit is 31.5in by 18.75in, so this is plenty of room for most users. According to the manufacturer, the max weight limit is 350 pounds. Overall, this kayak is an all-around solid performer. The Wilderness Systems Pungo 140 2018 Kayak is made with the large paddler in mind. This is a considerably affordable kayak for larger persons. It has an open cockpit so you can get a lot of gear in it. For an open and larger cockpit, it runs as fast as other high-end boats. The best feature is the speed of this boat. The length and stability make it perfect. The kayak provides straight tracking because of its unique stern. It also provides stability in larger waves and swells. Great kayak for photography with its stability in the water. Overall it is a very stable, straight tracking, fast kayak. This kayak is the longest in the Pungo series. The Pungo 140 offers great stability, a spacious cockpit, and enough room for storage. The bow and stern hatches keep your valuable gear dry and secure. The seating system is adjustable in several dimensions. The sliding foot brace system moves to apt your height. It also comes with thigh and knee pads to protect your legs during an all-day cruise. The Zest Two Expedition by Ocean Kayak is perfect for lakes, canals, and the ocean. It is extremely smooth and stable on both rough and still water. The size is ideal for 2 adults or 1 adult/2 kid. Workmanship, features, space, stability, handling, and speed; comparing all the elements, the Zest Two Expedition is one of the best sea kayaks available on the market. The Zest Two is perfect for a day trip or weekend adventure. It also performs great as touring kayak for warmer paddling environments. The Zest has enough storage space. It is easy to carry and very maneuverable. The other essential features of this kayak are molded-in cup holders, bow deck bungees seating enough for two adults & a small child or pet. The Zest Two weighs about 75 pounds with the max capacity of 500-600 pounds. The Quest 10 HV is for stability and ease of maneuverability. Those who like relaxed and simple kayaking, this kayak is an ideal option for them. The Quest 10HV is 10 feet long and weighs about 64 pounds, and easy to carry down to the water by a car. The large cockpit offers plenty of space and easy entry for even larger paddlers. The seat is ultra-comfortable with a backrest. There are bottle holders and a small waterproof pod to keep small valuables dry. The Quest is best on rivers and small lakes, but you can also use it on calm bays with its optional half spray deck. The Quest 10 HV also features quick-lock adjustable foot braces, dual-density hatch cover, rear bulkhead, foredeck shock cord storage, 2 flush mount rod holders, and drain plug. It measures 10ft by 30in by 14in; the cockpit is 39in by 19.5in; the hatch is 15.75in by 8.13in. The Quest 10 HV is the perfect for fishing or just a leisurely trip on a summer afternoon. The Advanced Frame is an inflatable, folding frame kayak. Extremely durable materials were used in its 3-layer construction, and this kayak features many high-end components. Durable triple-layer polyester with double PVC coating offers excellent puncture resistance, and welded seams ensure long life. It has built-in aluminum ribs in the stern and bow, and it performs like a hard-shell kayak. The stern performs as a skeg which increases the tracking performance. It requires just a few minutes to set and is enough compact to take along on your next weekend adventure. There is plenty of storage room for extended trips. Each of the Advanced Frame kayaks is designed for the higher performance. Therefore each accessory offers their own advantages, both work to enhance the rigidity and tracking performance. They offer the patented BackBone accessory or rigid high-pressure floors that use Drop-stitch technology. The Spring valve and Twistlok valves are easy to use and compatible with most pumps. The Advanced Frame Comes with a heavy-duty duffel bag and a repair kit. The sea kayaks expand your horizons infinitely while an average recreational kayak puts limits. That’s why you need to consider the features of a sea kayak before making the decision. In this article, our experts have tried to share most of the available relevant information about the products to help you so that you can pick the best kayak and take your ambitious voyages at sea to another level. Hope that helped you.